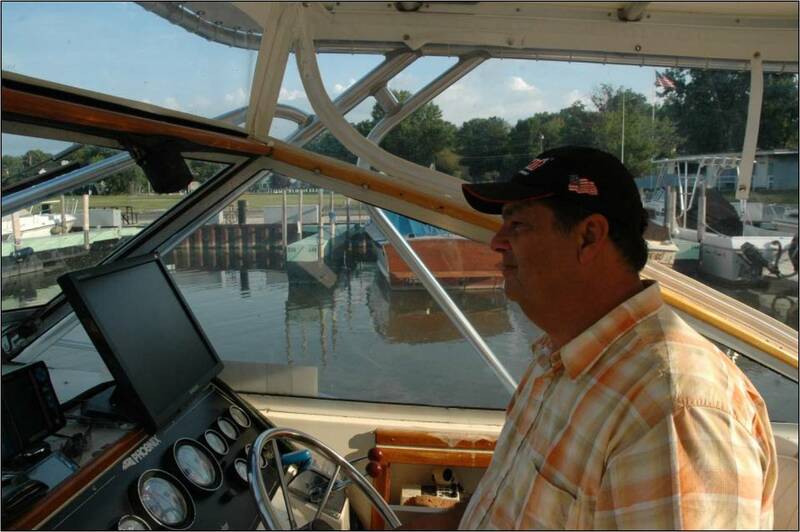 On July 23, 2015, while performing sidescan searches in the continuing long term effort to locate and identify shipwrecks in the waters of Lake Erie, a new sidescan sonar target was discovered by CLUE member Tom Kowalczk. The detailed sonar imaging provided enough information for CLUE to assemble a field team to further investigate this find. On August 16, 2015 the dive team made the first site survey dives collecting basic in situ dimensions and site layout data. Since then historical research by Tom Kowalczk and our sponser, The National Museum of the Great Lakes, have narrowed the possibilities from over 200 shipwrecks to 3. The Lake Serpent is the best possible candidate of shipwrecks known to be in that area that match the known features of the wreck. Two other possible candidates that do not fit the data as well are the vessels Fair Play and Victor. To make a final identification we need to spend about 10 days underwater excavating the portions of the buried schooner to be sure! We are raising funds to pay for approximately 10 days of underwater surveying and excavation of a shipwreck we believe is the Lake Serpent. Identifying and surveying this shipwreck is important because once completed we will understand why the Lake Serpent sank in 1829 and the site can tell us about early 19th century shipbuilding techniques that were used in Cleveland Ohio, where she was built. The Lake Serpent was built in Cleveland in 1821 and carried general cargo for 8 years until late September or early October 1829. The Cleveland Weekly Herald reported on October 8, 1829 that the ship had left four weeks ago to get stone at Put-In-Bay and had not been heard from. The newspaper was able to confirm that the Lake Serpent had loaded the stone at Put-In-Bay, but hadn’t been seen since. It was finally reported as the bodies of the Captain and his brother, Ezra and Robert Wright, had been found on the shore in Lorain County in the first week of October, 1829. With that, it was believed that the Lake Serpent had been lost. The shipwreck has been lost until now. Ten days of underwater surveying and excavation will cost about $13,000. We can do it so inexpensively because our volunteers do the majority of the work. We have already raised $6,000 from our friends in the local community and need to raise an additional $7,000 to meet our goal. We need to excavate portions of the boat to determine if a sea-serpent figurehead is attached to the bow and if the boat is carrying the stone cargo newspapers at the time reported she was carrying. 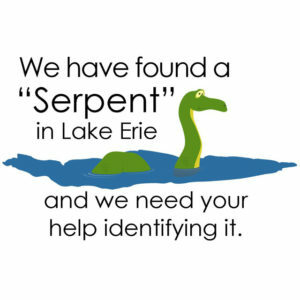 Your contribution will help us identify whether or not we have found the Lake Serpent. There are also benefits to donating, please click the button below to be taken to our fundraising site. On July 26, 2017 CLUE member Rob Ruetschle discovered a shipwreck tentatively identified as the long sought after Propeller Margaret Olwill was lost in June, 1899. Rob had been searching for the Olwill for 29 years while CLUE had been searching for the Olwill on and off for 11 years. The tentative identification was based on the wreck’s location and the condition of the wreck compared to survivor accounts of the sinking. 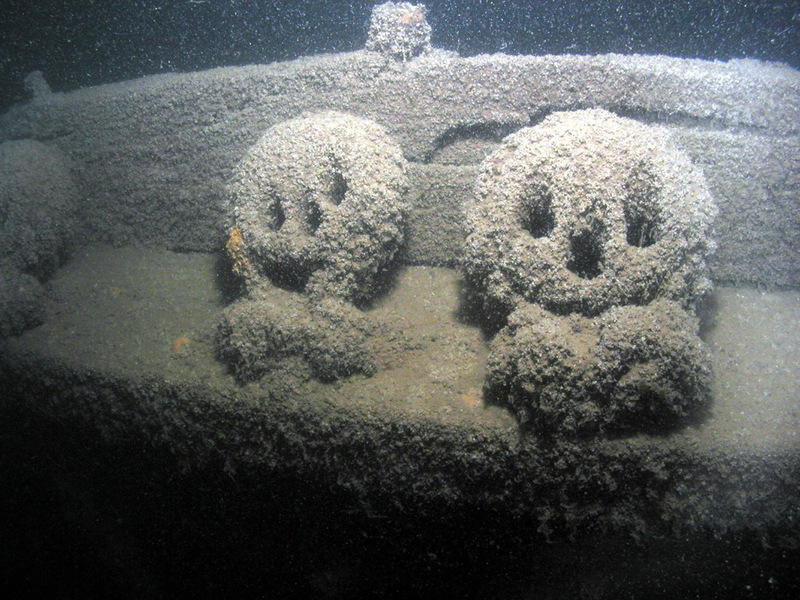 Rob and Rudy Ruetschle began searching for this wreck in 1989, 21 years before Rob joined CLUE. Late in the fall of 1989 after finding a promising target in the original search area, they moved onto other wrecks thinking they would come back to this target to verify the identity of the wreck the next spring. They didn’t return to that site until late October 2016. 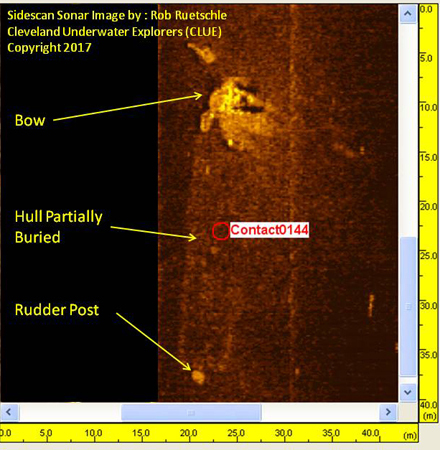 Sidescan sonar images of the target identified a rock formation with a large, approximately four-foot diameter by thirty-foot-long, sunken log lying on top of the rocks all surrounded by a mud bottom. Not the elusive Olwill. During December of 2016 Rob reexamined the old search area scans and all archival documents accumulated prior to the first search. After careful review he decided to take one more shot at finding this elusive wreck. He moved the search area and covered a new 25 square mile area before finding the wreck in the early evening of July 26, 2017. In all about 60 square miles of Lake Erie was searched to find this ship. Rob dived the wreck for the first time that same evening. The wreckage consists of a stem which rises about 14 feet off the bottom. Aft of this is a steel windlass followed by bollards on each side. Two anchor chains run through hawser pipes on top of a deck block and run out and disappear into the mud on both the port and starboard sides. The port rail is up and has part of the deck house framing posts, 4 in total, still sitting about six feet above the rail. Aft of the deck house framing the rail runs about another 90 feet towards the stern before breaking and becoming buried in the mud. The wreck is listing to the starboard side where it becomes buried in the mud bottom which is pushed up several feet from the hard impact when it sank 118 years ago. The engine and boiler were not found on this dive, so a second dive was needed to confirm the identity of the wreck. The following month a dive team consisting of Rob Ruetschle, Tom Kowalczk, and David VanZandt assembled and returned to the wreck site on August 9, 2017 to conduct a preliminary archaeological survey of the site. Dive conditions were marginal with an estimated visibility of 2 feet. The main objective was to document diagnostic evidence to support the theory that the wreck discovered was indeed the Propeller Margaret Olwill. That evidence was found early in the dive with the discovery of a vertical steeple steam engine located in the stern of the vessel. The steam engines layout is of a steeple configuration with a piston size of 36 inches. This matches exactly the historical data for the vessel’s machinery. So after 29 long years of searching by Rob and 11 years by CLUE we are confident enough in the evidence to announce the discovery of the shipwreck identified as the Propeller Margaret Olwill. Lake Erie continues to give up her long held secrets about early 1800 – 1900 shipping and sailing. 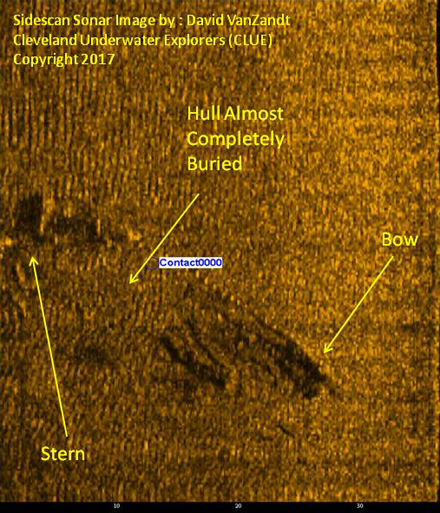 Over the past several years the Cleveland Underwater Explorers (CLUE) have discovered three more shipwrecks and confirmed the identity of one. These discoveries continue to add to Ohio’s rich maritime history. On July 17, 2016, CLUE members David VanZandt and Ken Marshall discovered a shipwreck while conducting sidescan sonar searches in the area where two other schooners are believed to be located. A highly broken up target was discovered but could not be investigated due to rough sea conditions. 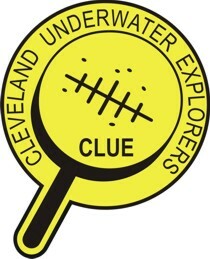 CLUE returned with a dive team on August 7, 2016. The target was investigated in poor visibility and was determined to be a sailing vessel, broken up and partially buried in the sandy bottom, in about 50 feet of water. It has been dubbed “Ken’s Tiller Wreck” until it can be positively identified. A few days later on July 22, 2016, another new shipwreck was discovered by CLUE member Rob Ruetschle. The wreck was dived on October 8, 2016 with the visibility being less than 1 foot. The wreck appears to be an old schooner with the bow, Sampson post, and windlass exposed, amidships is silt covered, and at the stern a rudder post protrudes out of the silt. The majority of the wreck is covered by about a foot of mud and silt. Two anchors are located off the wreck with one approximately 30 feet off the starboard bow and the other about 100 feet off the center bow. 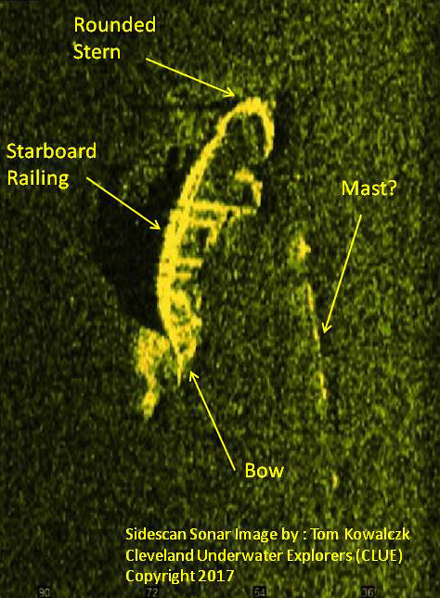 From the sonar images the bow is pointed, and the stern is square with a large object protruding out of the silted bottom about three to five feet off the stern. The length of the wreck is between 55 - 70 feet long determined from sidescan sonar measurements. The wreck had fish nets wrapped around the windless, some of which were cut loose and removed for diver safety. A small amount of coal was found on deck aft of the windlass possibly indicating the ship’s cargo. Future work also needs to be done at this site to obtain more data for a possible identification. The Cleveland Underwater Explorers (CLUE) are pleased to announce that the shipwreck Anthony Wayne was officially listed in the National Register of Historic Places (NRHP) on January 2, 2018. This is the first Ohio shipwreck to be listed in the NRHP! 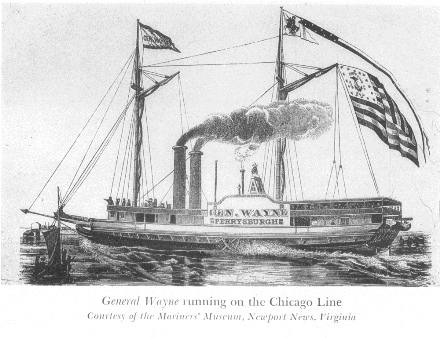 The Anthony Wayne was discovered by Tom Kowalczk of CLUE on 16 September 2006. It is a sidewheel steamboat that sank off Vermilion, Ohio, in Lake Erie when its boilers exploded in the early morning hours of 28 April 1850 while traveling between Sandusky and Cleveland, Ohio. 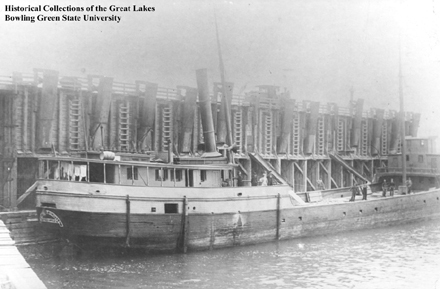 This historic shipwreck - the oldest known steamship wreck in Lake Erie - was initially surveyed by CLUE in 2007. 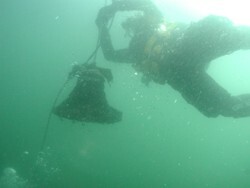 During the summers of 2008 and 2009, Tom, Carrie Sowden of the Great Lakes Historical Society (GLHS), and Bradley Krueger from Texas A&M University performed a full archaeological survey of this shipwreck , including the removal of approximately 1,600 cubic feet of silt to reveal its horizontal crosshead engine. Tom spearheaded the effort to the to have Anthony Wayne added to the NRHP which was ultimately made a reality with the generous help of the State Historic Preservation Office (SHPO) and Ohio History Connection in their preparation, review, and submittal of the formal registration form. 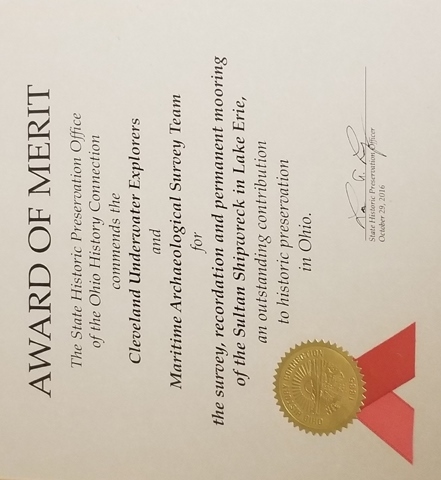 CLUE recieved the State Historic Preservation Office 2016 Preservation Merit Award along with the Maritime Archeological Survey Team for the Survey, Recordation and Permanent Mooring of the Sultan Shipwreck in Lake Erie. CLUE recieved a letter of commendation from the US Coast Guard for its efforts in the removal of 48,000 gallons of contaminated water from the tank barge ARGO.